When to stop driving: Why it’s so hard to get elderly drivers off the road. Why there’s no personal, societal, or governmental solution for what to do about elderly drivers. Last fall, Gordon Yeager, 94, and his wife, Norma, 90, died together, holding hands in the Iowa hospital where they had been taken after a car accident. The final chapter of the couple’s seven-decade love story made headlines around the world. What the fulsome tributes to the couple’s 72-year marriage generally failed to note was that the crash nearly ended another long love story. The Yeagers lost their lives after Gordon failed to obey a stop sign and plowed into the car of Charles and Barbara Clapsaddle, who have been married for 38 years. Charles was uninjured, but Barbara’s neck was broken. Fortunately, she can still walk. After a long hospitalization and rehabilitation, she has returned home where she slowly continues to recover. The collision had all the hallmarks of a car accident caused by an aged driver. When old people are involved in fatal crashes, the Insurance Institute for Highway Safety reports, their victims are most likely to be themselves and their equally elderly, frail passengers. Intersections are particularly perilous. According to a study in the journal Traffic Injury Prevention, intersection crashes accounted for about one half of the fatalities in accidents among drivers 85 and older. The study found that when drivers 70 to 79 were involved in intersection collisions they tended to misjudge whether it was safe to proceed. Those 80 and over simply failed to see the other car. As the boomers head toward senescence, the old will account for a growing percentage of the population, and thus an increasing proportion of people on the road. Most elderly Americans will end their lives with a valid driver’s license in their wallets. According to the IIHS, there were 22 million licensed drivers aged 70 and older as of 2008, representing 78 percent of that demographic group. The problem is that—lacking the Driving Miss Daisy option—there’s no clear personal, societal, or policy solution for what to do about older drivers. As many children of elderly parents know, it can be agonizingly hard to get older drivers who are no longer competent to hand over their keys. The stories of the carnage caused by unfit older drivers are sobering. There was 86-year-old George Weller, who drove through the Santa Monica farmer’s market in 2003, killing 10 and injuring 63. Two years ago, an 81-year-old Florida woman failed to yield when merging onto the highway, smashing into a bus carrying seniors on an elder hostel trip, killing at least two and injuring dozens. Despite these dreadful incidents, it’s wrong to assume that our streets are about to become the setting for the Cataract 500. Though the toll remains enormous, a fortunate trend over the past 40 years is that the roads are safer for everyone, with a national decline in traffic fatalities from a high of 54,600 in 1972 to about 33,800 in 2010. The reasons for the improvement are numerous, from a crackdown on drunk driving, to safer car design, to seatbelt laws, to the introduction of graduated licensing for teens. Older drivers, too, are less likely to be involved in traffic fatalities than in years past, with recent evidence showing a welcome and unexpected falloff. Anne McCartt, senior vice president for research at the IIHS, says older drivers are often unfairly demonized. For one thing, they are less likely than other groups to speed and drive drunk. And no group of drivers is more hazardous than teenagers, with their combination of inexperience and recklessness. But while teens mature and become safer, increasing maturity has the opposite effect on the old. Once people turn 70, their crash rates start to tick up. After 80, the acceleration is marked. Octogenarians on up have a higher collision rate per mile traveled of any age group except for teens, and their rate of fatal collisions per mile traveled is the highest of all drivers. More than one half of U.S. states impose restrictions on license renewals for older drivers. In Alaska, drivers 69 and older must renew in person, not by mail. The District of Columbia requires a fitness-to-drive statement from a physician starting at age 70. In Illinois, those 75 and over must take a road test. In Iowa, where Yeager lived, the renewal cycle is accelerated from every five years to every two years for drivers 70 and above. McCartt says studies on the effectiveness of these screening procedures have been mixed and that there is no certain way to identify the highest risk driver. “For most states, and most people in highway safety, the goal would be keeping older people driving as safely and as long as they can. Taking a license away is a major thing to do. It has a big effect on mobility and independence and states need good evidence before they impose this.” Motor vehicle administrators can also issue licenses with specific restrictions. For example, drivers can be confined to a certain number of miles from their home, or even allowed to travel only to church or the grocery store. As older drivers decline physically or cognitively, many do loosen their grip on the wheel voluntarily. 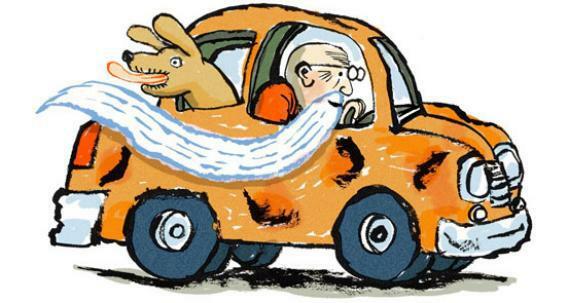 The IIHS reports that those 70 and over drive less than half as many miles annually as middle-aged drivers. Numerous studies show that many older people restrict their time on the road by no longer driving at night, avoiding freeways, or staying home during bad weather. My father-in-law died at 98 with a valid driver’s license (it expired on his 100th birthday), but he didn’t get behind the wheel for at least the last five years of his life. After a series of conversations with his children about their concerns that he was getting too frail to drive, he finally conceded it was time. This is the situation a woman, who asks to be called Lu, finds herself in with her father-in-law, let’s call him Roger. Lu and her husband live in Houston, while 83-year-old Roger lives near Dallas. Though Roger and his wife reside in a retirement community that provides a van for residents, Roger insists on having his own car. He insists despite the fact that his last arrest for drunk driving resulted in the suspension of his license by the state and the confiscation of his car by his son. One day, Lu’s husband—let’s call him Dave—got a call from the manager of the retirement community. She thought he’d want to know that his father had just turned up driving a white Chevy Cobalt. Dave flew up, checked into a motel, and hired a tow truck to haul the used car back to the dealership. Sometimes the problem is that the older parent is drifting away mentally, and facing this loss is just too painful for everyone. Writer Nancy Palmer’s mother, then in her 70s, was increasingly forgetful and had gotten lost driving home a few times. The family took her in for an evaluation and raised the possibility of taking away her license. “But she said the most poignant thing,” Palmer recalls. “She said, ‘I’ve been driving since I was 16.’ ” So the family backed off. One morning Palmer’s mother got in her Volkswagen Golf, went to the gas station to fill the car, and disappeared. At midnight, the frantic family got a call from the police two counties away. They had spotted Palmer’s mother driving erratically. She refused to stop when a police car approached with a bullhorn. Finally, the officers blew out her tires with spike strips. That was the end. Palmer’s mother continued to ask for her car keys but her children told her the car was too damaged to drive. Grown children who struggle to get their parents to hand over the keys can turn to the parents’ physician for help. But for one middle-aged woman, her 85-year-old father’s doctor turned out to be another roadblock. The woman’s father, who lives in Maryland, suffers from advanced Parkinson’s and freezes while behind the wheel, but he insists on driving himself to visit his wife, who’s in a nursing home. She begged her father’s doctor to report him to the state’s motor vehicle department. The doctor, though, said he’d only send a letter if the father agreed, which he defiantly did not. “It seems that the whole system is biased toward the rights of the driver, not the right of the public to be safe,” she says. When Yeager showed up last Oct. 7 at his local motor vehicle division, the condition of the 94-year-old concerned the employees. He was told he needed to take a road test. He failed. In Iowa, flunking drivers are given a suspension notice and a temporary permit—they have 30 days to retake the test and can do so as many as three times. So Yeager drove home, planning to try again. Dennis Yeager says his father told him he was “set up.” The elder Yeager claimed that at an intersection the examiner instructed him to get into a right-turn-only lane, then ordered him to drive straight. “That is not possible,” says Kim Snook, director of the office of driver services for the Iowa Department of Transportation. “Never have we used tricks to fail someone.” Five days later, Yeager and his wife were dead after crashing into the Clapsaddles’ Mustang.